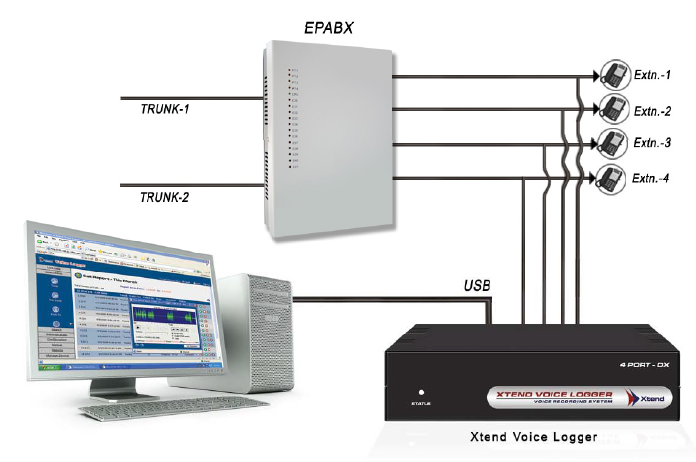 Automatically records the incoming/outgoing calls routed from analog, digital and VoIP lines. You can schedule the logging duration for trunk and extension lines, and restrict recording of certain phone calls e.g. personal calls. Implements an easy-to-use browser-based application accessible from any remote computer with extensive call reviewing options. Listen to active calls and get in-depth details about each recorded call from the secure interface with certain administrative rights. Multiple users can login to the browser interface at different access levels with administrative rights. Groups can be created for call monitoring and calls can be assigned to each user in user-defined groups. Browser interface comprises of advanced search features to retrieve call details on the basis of the given criteria. Perform an advanced search that lets you find the desired details within few moments. Audio files can be converted to advanced formats like GSM/MP3/PCM/G.711 A-law/?-law etc. to save disk space. Compressed audio file can be exported to another user via e-mail for data sharing. 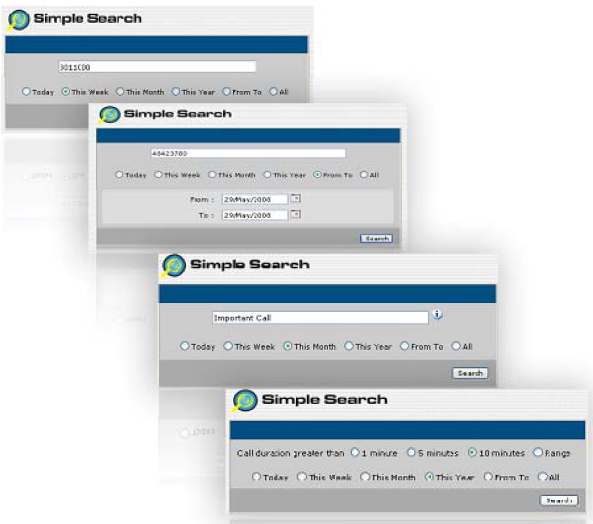 Get full-fledged call information from the browser interface. Call details comprises of Caller/Called ID, Date, Time, Duration and many other details in the form of reports which can be printed out as and when required. Complete telephone network can be monitored from a remote location and later the same files can be reviewed multiple times from the same interface accesssible anywhere at any time. Remote pop-ups alerts the remote call monitoring official about the active calls taking place in an organisation. To get an alert of ongoing calls download the Remote Client Download from the browser interface. 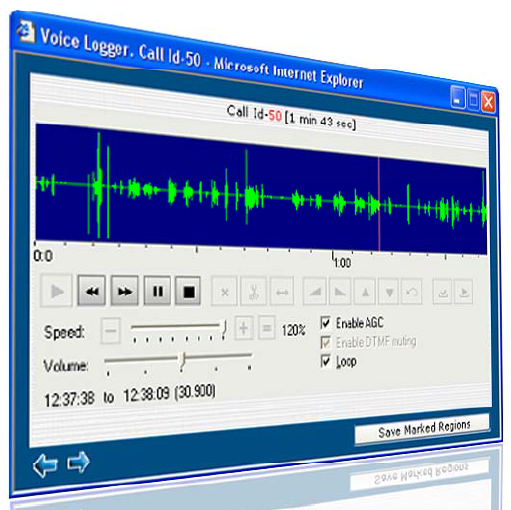 Listen to interactions, select and analyse the recorded audio file with advanced tools available in the Audio Player with AGC and DTMF muting. While listening, select and save multiple audio regions to a separate file. 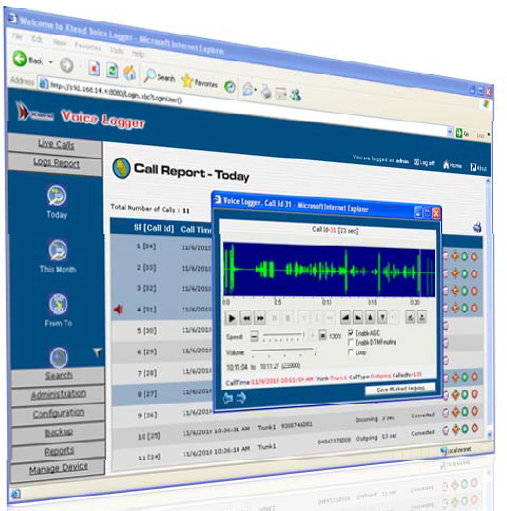 Xtend Voice Logger allows to take the the backup of calls to CD, DVD or HDD and also restores the backed-up files. Wave files can be compressed to multiple formats like GSM/MP3/PCM and exported via e-mail to a different user for sharing data. Easy connection for different analog and digital models to a single computer. User can access the single, secure and remote interface to monitor all the calls directed from multiple channels. Analog Voice Logger is available in 1/2/4/8/12/16/../128 ports and as per the requirement the design is scalable to log higher number of ports. Calls can be assigned specific tags for quick identification, these tags can be customised as per user's choice and remarks can be added to each call as per the significance. Phone Book gives you an easy way to gather and organise information about all your customer addresses and phones.